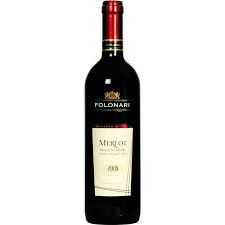 Folonari Merlot is 100% Merlot is aged in a combination of stainless steel tank and American oak barrels. Stainless steel aging helps the wine retain it's fresh, fruit driven character, while the oak softens the wine and adds spicy, vanilla notes. The wine is bright red in color with a bouquet of blackberry and raspberry followed by a soft, balanced finish. Bright ruby red color. Herbaceous nose with hints of raspberry. Dry flavor with notes of jam and raspberries. Folonari Merlot IGT is a great with Red meat, pizza, pasta and antipasto.